Oleksandr Usyk has been 'breaking stereotypes' as a champion, shunning fame for a life of dancing, poetry, and physical hardship before his battle with Tony Bellew. "I hate when people call me a star, because I don't consider myself to be a star." A huge gold trophy was thrust into Usyk's hands, with all four glittering world titles in his possession, and yet the Ukrainian was reluctant to acknowledge himself as one of the biggest names in boxing. Usyk had just manipulated Murat Gassiev through 12 rounds, disarming the heavy-handed Russian with fleet of foot and pinpoint punches to win the World Boxing Super Series final. 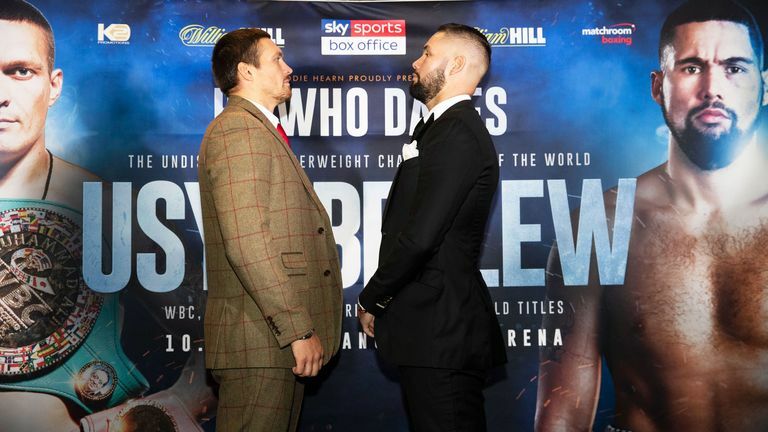 But it is success borne out of hours of physical preparation that inspires Usyk, not lurid fame, and he immediately issued a verbal challenge to Tony Bellew, who fights the unbeaten 31-year-old for his belts this Saturday night, live on Sky Sports Box Office. Usyk is already synonymous with dominance, having conquered his weight division in 15 fights, although this unwavering discipline to the sport was shaped after a humiliating defeat at the 2008 Beijing Olympics. "At the beginning I was angry, I searched for the ones who were guilty of my failure," said Usyk. "Then I called my older friends, I called my parents, then I prayed. I realised that I'm the only one to be guilty in that. "I understood that I didn't put enough effort in my training and didn't take it seriously enough. I completely changed my approach. "The year after the Olympic Games, I got married, and then my first kid was born. I realised that I'm responsible for the life I've created together with my wife and I started to limit myself in a lot of things, in order to achieve greater results. "If you want to be great in what you're doing, you really need to limit yourself, so I consider my life as the life of a monk." A poet, who created romantic verse for his wife Kateryna, he is far removed from the exaggerated machismo that often pervades boxing, preferring to indulge in a victory dance rather than direct venomous words to his rivals after another triumph. Usyk has been sleeping on a bed of straw, an indication of his Spartan lifestyle and fondness for the horses that are housed at his training base, and are warmly greeted by the champion before his daily sessions. "If you put a person in a training gym made out of entire gold, it doesn't guarantee that this person will become a champion. "But if you put a person in the basement then there is a high chance that he will get out of this basement as a champion." The best fighters are often forged in hardship, but Usyk has gleefully broken the mould for an elite boxer, indulging in tennis, football and fishing ahead of his trip to Britain. "We are breaking stereotypes," is the simple response from Usyk, when asked about recovery from gruelling sessions. "We just played tennis a bit, we did some training of our stabiliser muscles, core stabilisers, and also we did some dancing." There will be no gentle forehand from Bellew when they limber up for 12 rounds of brutal warfare this weekend, and casual observers would be foolish to assume that Usyk is overlooking the 35-year-old, fresh from two upset wins over David Haye. There is that same intensity in Usyk, a highly skilled southpaw, who will attempt to break Bellew's resistance with constant hurtful combinations. "Every morning I put myself on fire, literally, and I burn through the day. "At the end of the day, when I'm relaxing, I'm feeling happy. I may sound a bit crazy, but I get really excited with all the enormous hard work that I put myself through every day." Patriotic support and those seeking a romantic ending will firmly side with Bellew, a rightfully popular challenger who is approaching retirement. But boxing rarely delivers a desired finale and Usyk is only interested in producing another masterclass. "During my career, all my most fruitful victories have been on the opponent's territories, so the support of the British fans to Tony Bellew doesn't bother me a lot. "I also understand that British fans appreciate boxing and they will first of all cheer for the beautiful boxing, and in the end of the day, it's only three of us in the ring. "Me, him, and the guy in the white shirt, who will observe the fight that it goes according to the rules." A reluctant star, Usyk will continue to follow his own rules. Watch 'Usyk Undisputed' this Wednesday night at 10.30pm on Sky Sports Main Event and On Demand.